Copyright © 2015 Share International. All rights reserved. Soon, very soon now, men will realize the power that lies unused in their hands. They will see that they have the ability to change the quality of their lives. They are beginning to understand that freedom, justice and right relationship, one to another, are essential for man’s living. Many are calling for the structures which will ensure the creation of this blessed state. This makes clear to Maitreya that the world is ready for the new dispensation. Men should, therefore, use the limited time available to make known His presence and so prepare His way. Q. Does Maitreya, or do the Masters, distinguish between ‘refugees’ and ‘economic migrants’? A. They are all the same for the Masters. They are human beings and they all deserve life. Q. (1) Will the financial crash towards the end of 2015 be enough to bring in the new system? or (2) can we also expect to have world wars, disease, food and energy shortages during 2016? A. (1) No. (2) There will be the usual dislocation of life but there will be no world war. Q. (1) What is your Master’s opinion of the destruction of ancient sites, such as the Bamiyan Buddhas, and Palmyra in Syria? (2) Do you think it would be worthwhile and possible to restore them? A. (1) It is irresponsible. (2) Yes, to some extent. Q. There are many old superstitions relating to a ‘blood moon’; is there anything to these old myths? On 27-28 September 2015 there will be a blood moon, a lunar eclipse and a super-moon. Will these phenomena have any impact on events in the world – given that it is predicted to be a rather turbulent time? A. These events are not deeply significant. Q. I generally avoid conspiracy theories, but there are ongoing reports of NASA covering up by masking certain photographic evidence of the existence of UFOs. Does NASA try to hide information from the public? If so, why; surely the truth will out at some point? A. Yes; they are afraid of being superseded because of the attitude they have taken vis-à-vis UFOs for years. But, yes, the truth will come out. Q. Has Maitreya continued appearing on Chinese television? A. Yes, from time to time. Q. How many millions of people can be relied on to welcome Maitreya and accept Him when He makes Himself known as the World Teacher? Q. How many millions of people do the Masters think will be likely to accept Maitreya as the World Teacher on and in the near future following the Day of Declaration? Q. Does Maitreya still maintain a ‘facsimile’ of Himself in His ashram near Mysore in southern India? Q. When will Maitreya inaugurate the Day of Declaration? A. When humanity is ready. Q. I saw a video in 2001 saying that Maitreya has 1.5 billion people behind Him, ready and willing to aid in His task. How many people does He have now in 2015? Q. You said once that a source of water had been energized in Belgium by Maitreya. (1) Is it the Saint-Méen fontaine at Brûly-de-Pesche? (2) If no, where do the healing properties of water there come from? A. (1) No. (2) The Master Jesus. While at a Share International event on 7 June 2015 in San Francisco called ‘How Do We Fix Our Broken World?’ I walked outside to amend a promotional sign we had put on the sidewalk. I found a gracious ­middle-aged Hispanic man named Raul, with a very pure aura, looking intently at our sign. He spoke in accented English and said, “Thank you,” and that “we need people like you” for putting on events like this. He was effortlessly patient as I took notes about what he said during our conversation, asking him to repeat himself more than once. He said that this event provided “hope,” and “light in the darkness” and it was “motivating” for people. He said there are “a lot of good people, good souls, that are living in the darkness,” because the “real facts are not being exposed.” He indicated that “information is getting filtered,” and also that “people are afraid of getting persecuted for the expression of their ideas and beliefs” such as to “pray to whatever you believe”. He explained that the event educated people about “the meaning of their lives, the nature of the universe, and the nature of the Creator”. He said that it “makes people better warriors, better soldiers, with more wisdom and knowledge”. He said that this event was “a strong shield,” and a “code to hang in there and do what you have to do” to fulfil “your real purpose”. As he parted, he looked upward and said, “Thank you, Father, for me walking the streets (and finding signs telling about the event).” He had indicated that he had seen many promotional cards about the event in stores. He said he would be at the event later in the day. Could you be so kind as to say if this man was anyone special? On 29 November 2014, I was returning from my local supermarket on my mobility scooter when it suddenly ‘packed up’. It had not been charged up enough so I was stranded some distance from home. Fortunately, I saw two policemen walking towards me (on the pavement), both wore yellow jackets, so I told them how I was fixed. Could they have been Masters? I was on my way to join an anti-austerity march in London finishing at Parliament Square outside the Palace of Westminster on Saturday 20 June 2015. I had just disembarked from the train in Victoria, when I noticed a short oriental gentleman-farmer walking towards me. He radiated joy and people naturally turned to greet him. He wore a tall, well-made hat of grass with a tall feather sticking out of the top, a staff in one hand and with the other, trailed a black plastic dustbin bag with some plants peeping out of the top. He was well-dressed in a chemise, colourful waistcoat, leggings and stout shoes. I turned to look at him and noticed the smiling reaction of all the people he came into contact with. I am not sure if there was any connection, but this was interesting because I had just started growing vegetables on a biodynamic farm and I had been discussing the merits of a Japanese method of growing vegetables which permaculturists call ‘fuggaging’ (straw-mulched cropping) with a friend. Then I realised I was late and hurried towards the demonstration. Could this farmer have been a disciple of the Master Jesus? I would be grateful if you could kindly ask your Master. S.P., Ashurst Wood, W. Sussex, UK. Around the 28 July 2015, in our ice cream shop Laolao in the shopping center Forum Algarve in Faro, Portugal, came a small man of Indian origin and accent asking me for cigar­ettes and who never stopped telling me: “Thank you, thank you, thank you.” He came a few days in a row and was very pleasant. He was always dressed in blue like a simple man. Moreover these days we had a smell of incense in our home suddenly and we don’t use any incense. We are getting to know more about Maitreya and the Masters and we would like to know who was this man, if he was a Master or a simple man? The incense smell, is it from the Masters or is it imagination? L. and D.P., Faro, Portugal. I have seen a very strange pulsating light in the western sky twice this past week at 2.35am on 25 July 2015. It was about 4-5 days ago when I first noticed it at approximately the same time and location. It made strange movements which tell me it is not a known aircraft. I live in Chickasha, Oklahoma, and watch the stars most every night and have never seen anything like it before. What was it? Recently, I’ve been trying an experiment. If it’s not just imagination or coincidence it may be useful. 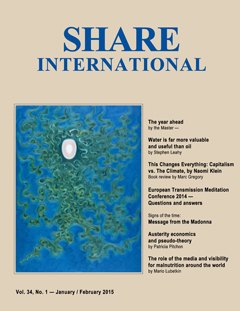 Sometime ago I was struck by a letter in Share International in which a spokesman mentioned that the groups’ attitude was self-limiting which, he seemed to suggest, was why no one or few people came to hear very important information. It made me think. A while ago we organized and advertised a lecture. Sometimes we get quite a few people attending events, but sometimes the audience is small, so I decided in a sort of act of faith and visualisation to really expect and ask for a specific number of people but without getting hung up on numbers. So having faith it would happen but not being bothered about how many people attend. The first time I ‘asked’ for 12. Eleven people came! The next time we thought we would double that request; so we put out 20 chairs and had a few more ready. We got 21 people (that’s a bit exaggerated because it includes two speakers who were giving the talk together)! We don’t know whether it’s just a fluke but we intend to try the same positive attitude in future. We know that the number of people attending isn’t the main issue and it’s tricky keeping a balance between being positive and not too concerned. It’s a bit like trying to be invocative. Thank you. Zack Clements, a 17-year-old high school football player from Brownwood, Texas, was running sprints at Victory Life Academy on 5 May 2015 when he suddenly collapsed, unconscious. Hospital doctors worked to revive him, but after 20 minutes without pulse or heartbeat, were about to pronounce him dead when his pulse returned. He was airlifted to Fort Worth’s Cook Children’s Hospital, where he woke up in the intensive care unit days later – and told his parents an extraordinary story. This year crop circles have been appearing in many parts of the world, but as always, many more formations have been seen in the fields of the west of England, especially the county of Wiltshire. Steve and Karen Alexander continue to photograph and write about these extraordinary phenomena, and report their findings in their website, temporarytemples.co.uk. We present a selection of quotations on the theme of ‘Testing times’. The quotations are taken from Maitreya (Messages from Maitreya the Christ and Maitreya’s Teachings – The Laws of Life), Benjamin Creme’s Master (A Master Speaks and Share International), and Benjamin Creme’s writings. The time has come to begin the process of change, to transform the life of men in such a way that the God in man shines forth. This, My friends, is not difficult of accomplishment for within you all sits such a Divine Being. My task will be to evoke from you that Shining Light, and take you to Its Source. The period of test begins. My plan is to place before you these two alternatives, to outline the possibilities and the pitfalls. The choice is yours; you, from your own divinely given free will, must decide. If you, as in My heart I know you will, decide for God, I shall take you to Him; and together we shall place before Him our life of service to Him and to the world. Many of My people, already, are so doing. It is this which confers on them the appellation, “My beloved ones”. Join this band of true servers of the world. The achievements of the age, the aspirations of the millions, the readiness to share, the aid agencies, organizations like the United Nations and the various international groupings which, behind the scenes, unite people with people and give a sense of internationalism and co-operation, will be maintained and will grow; they can only flourish in the new situation. But those which stand in the way, those narrow, nationalistic structures based on competition, market forces and greed, will find it impossible to stand against the “onslaught of the new”, the ideas of the new time. Spirituality is the essential nature of our being, simply needing demonstration in outer forms. Whatever we can conceive of as human activity can be, in fact must be, spiritual. True morality is not to do with a code of values which humanity evolves to suit a certain society or a certain religious belief, but something which is intrinsic in our spirituality. By My Presence, the Law of Sharing will become manifest. By My Presence, man will grow to God. By the Presence of Myself and My Brothers, the New Country of Love shall be known. Take, My friends, this simple Law to your hearts. Manifest Love through Sharing, and change the world. Create around you the atmosphere of peace and joy, and with Me make all things new. Inevitably, some countries will find the changes easier to achieve than will others. Some will find that the groups who, for centuries, have wielded power and built their citadels of wealth will be loath to relinquish that supremacy, but the forces for change will become so insistent and unstoppable that they, too, will have to alter their direction and adjust to the demands of their people. Thus a new society will evolve with remarkable speed, one that holds sacred the right of all people to self-determination, the democratic right to involvement in their society and their future; their right to adequate living standards, healthcare and education. Above all, men will claim the right to live in peace. For many years We, your Elder Brothers, have warned men of the dangers of blindly following market forces which, themselves, are blind. Thus, the present widespread economic and financial crisis should not be unexpected. The ‘bubble’ created by competition and greed had, inevitably, to burst. Yet the ‘men of money’ who built this towering edifice on shifting sands are stunned by the outcome, are at a loss to understand the reasons for the catastrophe and are already looking for better ways of continuing the same folly. The people of the countries worst hit by the recent events, however, know well the reasons for the collapse, and are angry in the knowledge that it is they who will suffer hardship and want in the months and years ahead. Maitreya, waiting patiently in the wings, sees this as a ‘window of opportunity’ which allows Him to emerge openly and begin His outer mission. Thus, the long wait for His emergence is almost over. Very soon indeed now men will hear Maitreya’s call for action and for change. Already, amid the myriad analysts the media have turned to for explanation and advice in the current crisis are a few who wisely warn that radical change is essential; that control and regulation of the ‘men of money’ must be a top priority to prevent a repetition. The people call for fairness and justice and are in no mood to be ignored. Thus the stage is set, at last, for the words of Maitreya to be heard, and to be seen as sensible and true. He will tell men that the continuation of the present disorder will bring only further chaos; that only a complete and ordered reconstruction of the world’s economic system will bring justice and peace; that without such justice and peace the future would be bleak indeed. He will tell them that we have the answer in our hands, that the world is one; that we live and prosper as one or face annihilation. These things, bit by bit, Maitreya will tell the world and the people will respond. Before their present leaders, they will see His good sense, and welcome the opportunity to put into practice His advice. For several years now, there have been warnings that the world’s water supplies are diminishing. As with so many warnings, we have given them a serious nod, then returned to our daily routines certain that the experts would fix the problems. After all, we say, what can we do? Stephen Leahy’s big, boldly illustrated book, Your Water Footprint,is a consciousness-raising workbook, aimed principally at North Americans, which details the amount of fresh water it takes to sustain our high-consumption ways of living, and how our lifestyle is draining our planet dry. Starting with the statement that 30 trillion gallons of rainwater fall to Earth daily, Leahy writes that most of it ends up in the oceans. Only 2.5 per cent of all the water available on Earth is fresh, and much of that is locked up in ice and permafrost. Put another way, if an 18-liter bottle represents all the water on Earth, only three teaspoons represent drinkable freshwater. Those of us who live where rain is abundant, even considering cyclical drought, are blissfully unaware of how precious our water is. The average North American uses 378 liters of fresh water for daily activities, not counting lawn watering, car washing and filling swimming pools. But in parts of Africa and Asia, women walk 6 kilometers a day carrying a few liters of (hopefully potable) water in buckets on their head for drinking, cooking and cleaning. One wonders, when the world practices the just sharing of resources, at the magnitude of the transportation system needed to share fresh water. And how will developed nations with abundant fresh water resources learn to reduce unnecessary usage? First, we must become aware of how much water (fresh water at that) it takes to produce the food, clothing and energy we buy. Leahy illustrates this with clever, understandable graphics showing the “virtual water” numbers – the unseen water needed for growing and manufacturing – commonly used items. Here is where the consciousness-raising really begins. Taking cola as an example, there is first the direct use of freshwater since cola is almost all water. However, the additional virtual water number is derived from the amount of water needed to grow and refine the sugar and vanilla, and retrieve caffeine from coffee beans. There is also the plastic bottle made from oil, involving an industry that is a notorious water consumer. Lastly, there is the water needed for producing the packaging and enabling the shipping. In the end, the water footprint of one 17-fluid-ounce bottle of cola is 175 liters. It takes an enormous 15,400 liters (4,068 gallons) of water to produce one kilogram (2 pounds) of beef. One cup of tea requires 35 liters of water, whereas one cup of coffee needs 140 liters. One cotton T-shirt requires 2,500 liters of water to produce, one pair of jeans 7,600 liters. The pulp and paper industry uses and pollutes more water per ton of product than any other industry in all industrialized countries. Energy production is the second largest user of freshwater: 40 per cent of industrial water consumption in the US is used to cool power plants. Leahy notes that the water footprint of any power plant must include the water used in mining the coal or uranium, extracting natural gas, and building infrastructure. Whether a plant is fueled by coal, natural gas or nuclear fission, water is heated into steam to turn turbines that produce the electricity. Water is used to produce energy, and energy is used to pump and distribute water, so the higher the demand for energy, the higher the water usage. Most of that water is returned to its source, the nearby river or lake, but it is hot water that kills fish and aquatic wildlife. Although plants built in the last 30 years recirculate their cooling water, older plants do not. Leahy completes his concise analysis of the massive water usage in the oil and gas industry by noting that although energy corporations are among the richest in the world, they use and pollute untold liters of freshwater (apparently reliable data is not “readily available”) and pay nothing for it. Hydroelectric power, coming from dams, also has a high “water-to-electricity footprint” due to evaporation in the associated reservoirs. Leahy cites the example of Colorado River’s Lake Mead created by the Hoover Dam near Las Vegas, Nevada, that loses 1.1 trillion gallons of water every year to evaporation and at last published measurement was at the lowest level since it was built in 1937. Solar and wind power use no water, Leahy writes, except for that used in building the infrastructure. Recent developments in the design of solar concentrators (huge banks of mirrors that reflect solar heat onto a water tower for generating steam that powers a turbine) have led to smaller water footprints than older concentrators. The newest Mojave Desert plant employs a dry cooling method that takes only as much water as is used to maintain two holes on a golf course while delivering enough power to support 100,000 homes. When it comes to wind power, Leahy writes that in 2013, the increased use of this renewable source of energy in the US reduced annual water consumption for electricity generation by 154 billion liters, or 490 liters per US resident, while at the same time reducing CO2 emissions from power plants by 95.6 million tons. Leahy cites The American Wind Energy Association figures that this reduction in CO2 is like taking 16.9 million recently-manufactured cars off American roads. Clearly the data favor moving to solar and wind power as soon as possible, while improving the technologies used. In areas of the world where water is naturally scarce, solar and wind will be key to a sustainable future. In his extensive discussion of how water is accessed and used, where it is stored and how much more groundwater is used than is replenished, Leahy gives the reader a dynamic picture of the role of water in our lives. His emphasis is on awareness in the hope that each of us will learn to use water wisely and demand that our industries evaluate and limit their water footprint. In a Washington Post article published 15 July 2015, a decade-long study using NASA satellite data has shown that 21 of the world’s 37 largest aquifers are now below sustainable levels. Groundwater, the source for agricultural and urban use around the world, is being depleted faster than it can be replenished, and the higher salinity of groundwater is slowly killing crops. Leahy writes that 1.6 million hectares of farmland are abandoned annually because of salt buildup. That is equivalent to the area of Connecticut and Rhode Island combined – every year. Growing urban populations, combined with drought around the world, has increased the drilling of water wells to the point where the situation is critical. Leahy writes that 23 million tube wells have been sunk by farmers in India needing to irrigate their crops. In one Indian state, the water table has dropped by 6 meters. It takes decades if not centuries to recharge these aquifers. An article at takepart.com, ‘Thirsty yet? Eight cities that are improbably running out of water’, reports that there are eight major cities running out of water for a variety of potentially fixable reasons, including poor management and antiquated engineering: Tokyo, Miami, London, Cairo, Sao Paulo, Beijing, Bangalore and Mexico City. Leahy closes with a section on water-saving tips for the individual that seem insignificant given the daunting global facts and trends, but he assures the reader that every effort is of value. Yes, do take shorter showers, save paper, repair water leaks, keep cold filtered tap water in the fridge instead of buying bottled water, for example. • buying from businesses that promote water conservation. Stephen Leahy, Your water footprint: The shocking facts about how much water we use to make everyday products. Firefly Books, 2014. But Douste-Blazy goes further than simply describing the migration crisis an atrocity: he calls for both emergency, immediate short-term humanitarian assistance and “a sustained global push to reduce extreme poverty over the coming decades”. Although he acknowledged that many refugees were fleeing violence and oppression in countries such as Syria, Eritrea, Somalia and Sudan, Douste-Blazy also emphasized that “we have 50 per cent who are trying to escape from extreme poverty”. The UN special adviser said that the enduring crisis ought to persuade the world of the need to invest more in fighting poverty. With the UN due to meet later this month to agree the sustainable development goals (SDGs), which will replace the millennium development goals and set the global agenda for the next 15 years, he said the world needed to put its money where its mouth is. “We have to take advantage of this gathering in New York and say, ‘Look, we’re going to organize innovative financing for development to reach these SDGs’ – a Marshall plan for sub-Saharan Africa because I don’t know one person in Mali, in Senegal, in Ivory Coast, in Syria, who would be happy to come to London, Paris or Oslo if they could stay there with their family,” he said. Kofi Annan, former secretary-general of the United Nations, said in June 2015: “It is time to accept the reality that, like the waves on the seas that many of the migrants traverse, the ebb and flow of human movement cannot be stopped. That is why the international community must manage migration with understanding and compassion…. “Those migrating today are doing so for the same reasons that once spurred millions of Europeans to leave their countries. They are fleeing poverty, war, or oppression, or are searching for a better life in a new land…. “This is not a call for unrestrained migration. But it is important that we accept the fact that efforts to block migration are bound to fail, with disastrous consequences for human lives – whether they are lost on sinking boats in the Mediterranean and the Andaman Sea or threatened by xenophobic violence in South Africa, India, or elsewhere. Europe is facing a crisis, with scores of people making dangerous journeys across the Mediterranean and on foot across Europe to escape conflict and poverty at home. The Reverend Jesse Jackson says the human rights of all migrants searching for a better life need to be “affirmed.” “Europe and the US are the have-nations, in part much of the have comes from the resources from the have-not nations. You have this huge gap – wealth gap, income gap, education gap and resource gap –and so the have-nots and the desperate are coming to where the resources are. Islamic leaders from 20 countries have released a sweeping new declaration on climate change, calling on their fellow Muslims to care for the planet and asking world leaders to phase out their use of fossil fuels. Attendees at the International Islamic Climate Change Symposium in August 2015 concluded their summit in Istanbul, Turkey, by issuing a formal declaration on global environmental issues. The declaration – which clearly stipulated that climate change is both real and “human induced” – was equal parts theological and scientific, using an Islamic moral lens to insist that world leaders take immediate action to assist our warming planet. “What will future generations say of us, who leave them a degraded planet as our legacy? How will we face our Lord and Creator?” the authors added. The statement also made specific recommendations for world leaders who plan to attend the upcoming UN-sponsored international talks on climate change to be held in Paris. The authors called on wealthy nations to phase out their use of fossil fuels and switch to renewable energy systems, as well as aid impoverished communities currently suffering from the harsh impacts of climate change – including parts of the world densely populated by Muslims. “We call upon [leaders participating in the Paris talks] … to bring their discussions to an equitable and binding conclusion, bearing in mind … the enormous responsibility the [conference] shoulders on behalf of the rest of humanity, including leading the rest of us to a new way of relating to God’s Earth,” the document read. The declaration was signed by the assembly’s 60 participants, including prominent Muslim voices such as Shaban Ramadha Mubajje, the grand mufti of Uganda, and Mohamed Ashmawey, head of Islamic Relief Worldwide. In addition, organizers of the conference – Islamic Relief Worldwide, the Islamic Forum for Ecology and Environmental Sciences, and GreenFaith – noted in a press release that the declaration was endorsed by other leaders not at the conference, such as the grand mufti of Lebanon. “On behalf of the Indonesian Council of Ulema and 210 million Muslims we welcome this Declaration and we are committed to implementing all recommendations,” Din Syamsuddin, Chairman of the Indonesian Council of Ulema (a body of Muslims scholars), said in a statement. The declaration by the Muslim leaders followed the widely praised encyclical released by Pope Francis in June 2015 in which he called for a drastic transformation of the world’s economies and energy systems in order to forestall the worst impacts of climate change. Additionally, hundreds of rabbis released a Rabbinic Letter on the Climate Crisis in May 2015 and dozens of other denominations and churches have joined the global movement to divest their financial holdings from the fossil fuel industry. While the Islamic symposium’s statement was geared towards world leaders, it also included a call for Muslims in all walks of life to tackle climate change in their daily lives.